Splashbacks of Distinction have access to an exciting new range of glass kitchen splashbacks in a wonderful spectrum of the most striking colours and designs to add a bright and unique finish to your kitchen, bathroom or living space. You don't have to be make do with a smooth and clear glass splashback, we can supply the most vibrant glass splashbacks to ensure your home becomes the envy of all your friends and family. We offer sleek, contemporary and pratical glass splashbacks for kitchens that offer a fantastic alternative to ceramic tiles. You really couldn't make more of a unique statement than to have a professional glass splashback fitted in your home. From the boldest of colours to striking shimmering metallics, Splashbacks of Distinction can supply you with them all. Our collection of wonderful glass splashbacks offer you with the ulitmate statement piece to any kitchen. Transform your kitchen with a high gloss coloured and textured glass splashback in any size you want. These splashbacks really are quite breathtaking, with colours from the stimulating to the soothing and some very pleasing textures. 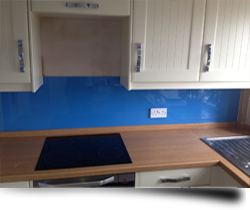 Originally, people wanted smooth glass kitchen splashbacks because they were so easy to clean and keep clean. Nowadays, more and more people are opting for a textured finish because they have that much more style and are far more unique but are still just as easy to keep clean and hygienic. Splashbacks of Distinction offers a fast and simple survey and fitting service, professionally delivered so you can start enjoying your new glass kitchen splashback in it's true beauty. Transform your kitchen today by calling on Splashbacks of Distinction.